There are four dock widget areas as given by the Qt::DockWidgetArea enum: left, right, top, and bottom. You can specify which dock widget area that should occupy the corners where the areas overlap with setDockWidgetCorner(). 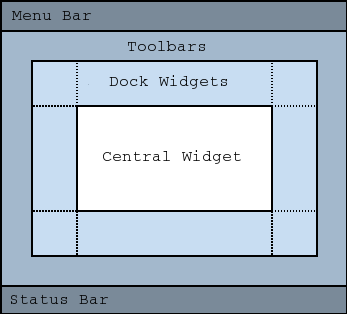 By default each area can only contain one row (vertical or horizontal) of dock widgets, but if you enable nesting with setDockNestingEnabled(), dock widgets can be added in either direction. If you call showFullScreen() on the main window, the QToolbar will disappear since it is considered to be part of the title bar. You can work around this by doing the following by turning off the unified toolbar before you call showFullScrenn() and restore the value after you call showNormal().